Respite literally means a period of rest or relief. Respite care provides a caregiver temporary relief from the responsibilities of caring for individuals with chronic physical or mental disabilities. Respite care is often referred to as a gift of time. Respite was developed in response to the deinstitutionalization movement of the 1960s and 1970s. Maintaining individuals in their natural homes rather than placing them in long-term care facilities was viewed as beneficial to the individual, the involved family, and society (in terms of lowered health care costs). The primary purpose of respite care is to relieve caregiver stress , thereby enabling them to continue caring for the individual with a disability. Respite care is typically provided for individuals with disorders related to aging ( dementia , frail health), terminal illnesses, chronic health issues, or developmental disabilities. More recently, children with behavior disorders have also been eligible for respite care. Respite care is usually recreational and does not include therapy or treatment for the individual with the disability. Caregivers frequently experience stress in the forms of physical fatigue , psychological distress (resentment, frustration, anxiety, guilt, depression), and disruption in relations with other family members. The emotional aspects of caring for a family member are often more taxing than the physical demands. Increased caregiver stress may result in health problems such as ulcers, high blood pressure, difficulty sleeping, weight loss or gain, or breathing difficulties. Length of respite care can be anywhere from a few hours to several weeks. Services may be used frequently or infrequently, such as for emergencies, vacations, one day per week or month, weekends, or everyday. In-home respite services consist of a worker who comes to the family home while the caregiver is away. These services are usually provided by agencies that recruit, screen, and train workers. This type of respite is usually less disruptive to the individual with the disability, provided there is a good match between the worker and the individual. However, issues of reliability and trustworthiness of the worker can be an additional source of stress for the caregiver. Respite centers are residential facilities specifically designed for respite care. Adult day care programs and respite camps also fall into this category. This type of respite offers more peace of mind to the caregiver, and may provide a stimulating environment for the individual with the disability. However, centers usually restrict length of stay and may exclude individuals based on severity of disability. Institutional settings sometimes reserve spaces to be used for respite purposes. These include skilled nursing facilities, intermediate care facilities, group homes , senior housing, regular day care or after-school programs for children, and hospitals. Some of these facilities provide higher levels of care, but are less home-like. The individual with the disability may oppose staying in an institutional setting or may fear abandonment. Licensed foster care providers can also provide respite services in their homes. Costs of respite care present a financial burden to many families. Community mental health centers often fund respite services if the individual meets certain criteria, including eligibility for Medicaid. Wraparound programs (also accessed through community mental health centers) for children with emotional or behavioral disorders also pay for respite services. Veteran's Administration hospitals provide respite care at little or no charge if the individual receiving the care is a veteran (but not if the caregiver is a veteran). Private insurance companies rarely pay for respite, and many respite providers do not accept this form of payment. Some respite facilities have sliding-scale fees. Other facilities operate as a co-op, where caregivers work at the facility in exchange for respite services. In addition, respite agencies may have difficulty recruiting and retaining qualified employees, because limited funding prevents agencies from offering desirable salaries. The high turnover and unavailability of employees may result in delays in service delivery or family dissatisfaction with services. Advocacy for policy changes regarding funding is needed. Recent research suggests that families who use respite tend to have higher levels of perceived stress, lower levels of support from others, and fewer resources. In many of these families, the individuals in need of care have more severe disabilities, problem behaviors such as aggression or self-injury, and communication difficulties; are school-aged; and are more dependent for basic needs such as eating, toileting, and dressing. Unfamiliarity: Some families are unaware that such services exist, or may be uncertain about how to access services. This implies a need for improved referral services. Funding: Limited funding may prevent some families from receiving services. Caregiver qualities: Some caregivers experience guilt or anxiety over allowing someone else to care for their loved one. Being able to maintain one's family independently may be tied to gender roles or cultural customs. Relatives and friends may assist in caregiving, making formal respite unnecessary. 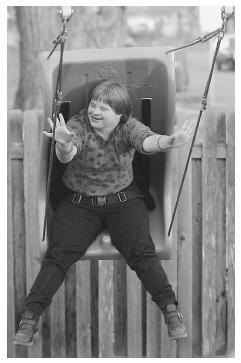 An adolescent swings on the playground at a respite care facility that provides short-term care for families who have children with developmental disabilities. Care recipient qualities: Occasionally the individual with the disability is opposed to respite care. He or she may not trust strangers or may refuse to leave home. In other instances, the individual may have behaviors, or require physical care, that is too challenging for the respite provider. Program qualities: Many researchers believe that respite programs are not adequately meeting the needs of families. In some cases, times that services are offered are inconvenient. Individuals with severe disabilities who pose the most need for services are sometimes excluded. Many caregivers obtain respite in informal ways not offered by respite services. Some researchers have suggested that respite care should be just one form of service available to caregivers. Other services that may alleviate caregiver stress could include home-delivered meals, transportation assistance, recreational resources, or care skills training. Ownby, Lisa L. Partners Plus: Families and Caregivers in Partnerships: A Family-Centered Guide to Respite Care. Washington, DC: Child Development Resources, U.S. Department of Education, Office of Educational Research and Improvement, Educational Resources Information Center, 1999. Tepper, Lynn M. and John A. Toner, eds. Respite Care: Programs, Problems, and Solutions. Philadelphia: The Charles Press, 1993. Chan, Jeffrey B., and Jeff Sigafoos. "A Review of Child and Family Characteristics Related to the Use of Respite Care in Developmental Disability Services." Child and Youth Care Forum 29, no. 1 (2000): 27-37. Chappell, Neena L., R. Colin Reid, and Elizabeth Dow. "Respite Reconsidered: A Typology of Meanings Based on the Caregiver's Point of View." Journal of Aging Studies 15, no. 2 (2001): 201-216. The Arc National Headquarters, P.O. Box 1047, Arlington, Texas 76004. (817) 261-6003; (817) 277-0553 TDD. thearc@metronet.com. <http://www.thearc.org> . ARCH National Respite Network and Resource Center. Chapel Hill Training-Outreach Project, 800 Eastowne Drive, Suite 105, Chapel Hill, North Carolina 27514. (888) 671-2594; (919) 490-5577. <http://www.chtop.com> . National Aging Information Center. Administration on Aging, 330 Independence Avenue, SW, Room 4656, Washington, DC 20201. (202) 619-7501. <http://www.aoa.gov/naic> . National Information Center for Children and Youth with Disabilities. P.O. Box 1492, Washington, DC 20013.(800)-695-0285. <http://www.nichcy.org> . Senior Care Web. <http://www.seniorcareweb.com> .